Sukhada Jog is a User Experience Researcher at Airbnb where she leads research efforts on the Hosts side of the business. Her goal is to help improve the experience for Airbnb hosts on both mobile & the web. 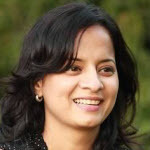 Prior to Airbnb, Sukhada was a Senior Manager of User Experience Research at Yahoo. She led the User Experience Research team within the Communications space. Her expertise is in generative and evaluative research. and has worked in various industries like finance, consumer product & packaging and electronics. Sukhada strives to embed User Experience tightly with the overall product development process and use collaboration more efficiently and effectively in the current business landscape.